The Spanish home at 10447 Wilkins Ave., LA CA 90024 lasted 195 days on the market before receiving an accepted offer on 12/10/09. 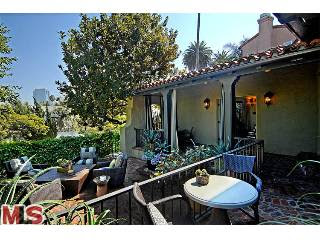 The home was listed on 5/29/09 for $1,850,000 and received one price reduction during the current listing term. The home also had 2 brief listing periods at the end of 2008 and beginning of 2009 where the home started with an asking price of $2,195,000. I thought this home was beautifully remodeled with designer type finishes throughout. An award wining garden and separate home office guesthouse completed the back yard. I think one of the biggest obstacles this house took so long to sell was it was very user specific. Until they converted the 2nd bedroom from a closet back to a bedroom, it was really a 1 bedroom house. I think most buyers are looking for 3 bedroom minimum, especially at this price point. According to the MLS, the home is a 2 bedroom / 2.5 bath home, 0 sq ft and 0 sq ft lot. Public records put the home size in the ~2,000 sq ft range and lot at ~6,750 sq ft. The home closed on 2/2/10 for $1,720,000.